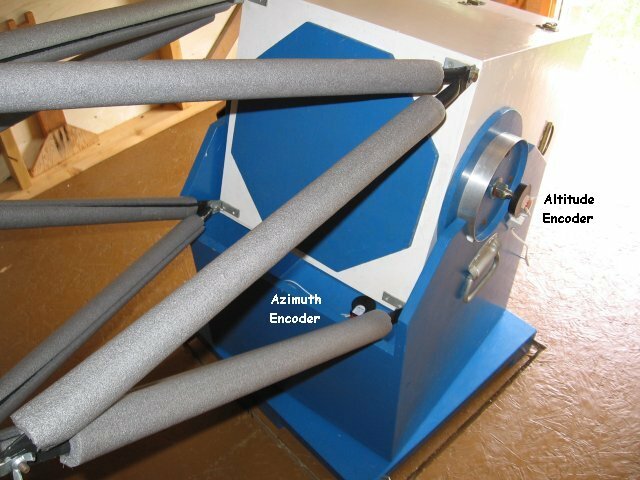 The axes of my 13" Newtonian in the Dobsonian configuration, has had its axes modified to accept angle encoders. Wiring has been installed from a computer desk to the Dobsonian platform. The photographs with captions show the installation. For explanation of Digital Setting Circles go to my DSC page. The angle encoders are US Digital model S2-2000 with resolution of about 3'arc (~ 1/20 degree). I use a encoder-computer interface called Ouranos which is no longer being produced (There are other similar and compatible interfaces still available.) It talks to the computer (or PDA) using its serial (RS-232) port. I use an older 400 MHz Celeron driven Acer laptop running Windows 98SE. My contolling software is the Earth Centred Universe written by Dave Lane. The telescope mount was designed and built to be disassembled for portability. With the encoders installed the telescope is not as easily disassembled but the encoder attachments does have only one screw and can be easily removed. A simple computer station has been put on the west wall and wiring installed to the telescope. This shows the relative positions. 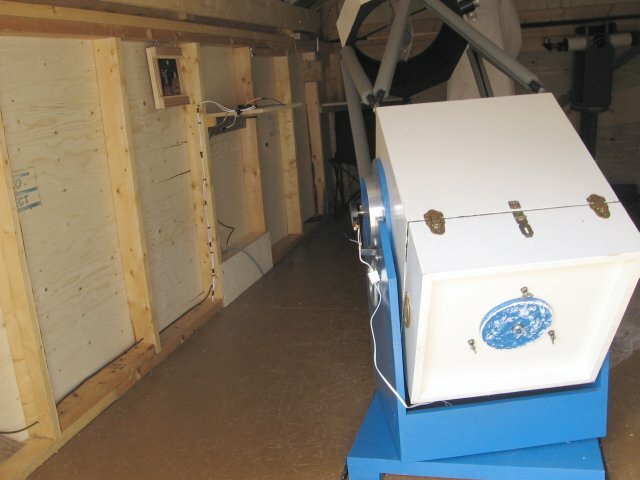 The shelf holding the computer has to be far enough away to not interfere with movement of the telescope, yet be close enough to be seen for aiming the telescope using the image on the computer screen. Close up of the azimuth encoder. The wiring for both encoders is threaded up through the hollow azimuth axis. The axis is attached to the base and the encoder is attached to the box. The hole for the wires is on the opposite side of the axis and hidden in this image. 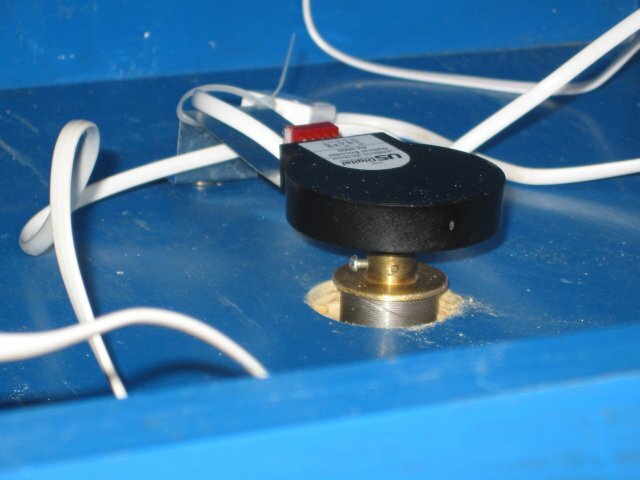 Close up of the altitude encoder. 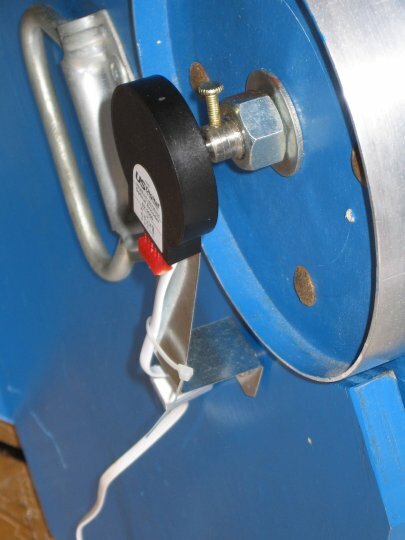 The bolt moves with the telescope while the encoder is attached to the box. The encoder wires are routed to the telescope by a hole to go under the floor to the telescope pad. There they go under the telescope base and up through the hollow azimuth axis. This way the wires are out of the way and tend to not get as tangled during movement of the telescope. 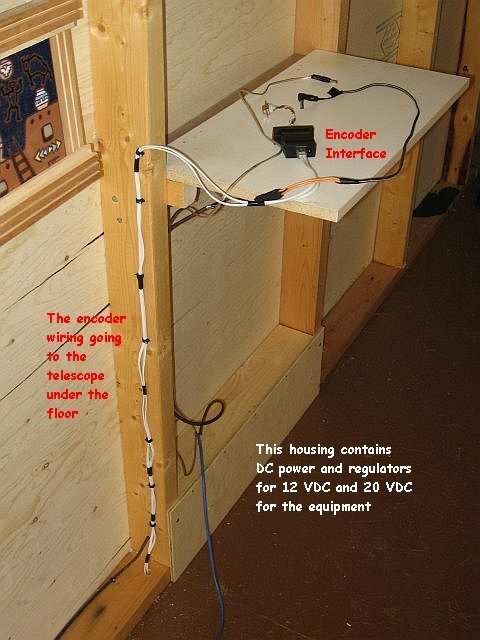 This shows the connections to the computer. 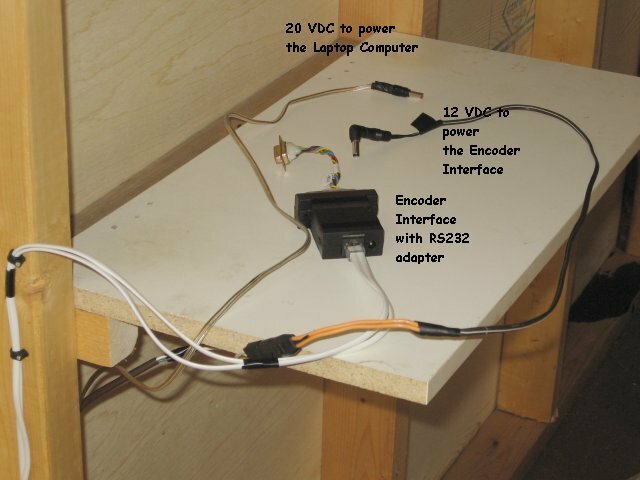 They are DC power to the computer and the computer interface, plus the RS-232 connection of the interface to the computer. The encoders allow me to move between dim objects in the sky with ease. I no longer have to use my star hopping skills, although I am glad that I developed them since they provided me with a familiarization with the sky that I would not otherwise have. My base for the telescope is not quite level and causes the synchronization with the sky to be off by as much as one field of view at low power. I will level the telescope to improve pointing accuracy.